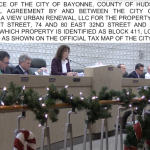 The Bayonne City Council voted unanimously (5-0) to approve a 25-year tax abatement to build 1,100 units at the former Military Ocean Terminal, but not before some residents complained about the governing body granting another tax break. 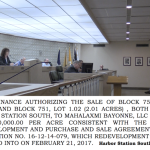 The developer, Mahalaxmi Bayonne Urban Renewal, LLC, plans to start construction this year and complete the project by 2021. 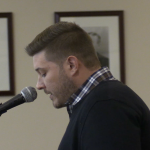 Perennial activist Peter Franco has been an outspoken critic of Mayor Jimmy Davis’ redevelopment plans that he says gives too many incentives to developers that have no ties to Bayonne. “We went from five-year abatements under a previous administration and mild development to a whole host of developments; there’s over 60 re-development agreements that the [current] administration has passed, and there’s no study that says whether is it effective and working,” Franco exclaimed. In that vain, fellow Bayonne resident Bruce Piggot believes that the city should slow down overall re-development to ensure that new buildings match a neighborhood’s aesthetics. 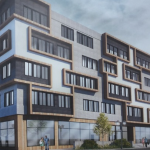 “On 46th street, they’re putting up a 10-story building with 90 units. Instead, they could have built six-story brownstone-looking structures with storefronts that would have had as many units rather than placing this ubiquitous building in the middle of Archie Bunkerville: they’re all two-family houses up and down the streets. However, Michael Miceli, a private attorney representing developers that are applying to the City for project approvals, said that tax abatements have played a crucial role in Bayonne’s renaissance, making the comparison to Downton Jersey City. “It’s a necessary tool in today’s world, especially when we’re staring at a revaluation, where the tax situation really is not clear. Lenders get very nervous about lending when they don’t know what the tax structure is going to be. So, the PILOTs particularly now are incentivizing and stabilizing the lending market for Bayonne,” said Miceli. 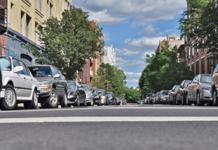 We followed up to ask why is it necessary for developers to seek tax abatements rather than rely on their own capital to redevelop properties. “I think that people should understand is that developers generally wind up funding all development through banks. There are very few people who can fund them as individuals. There might be a few billionaires who can do it on their own, but you’re always going to a bank with hat in hand, explaining that it will make money and this is why. If [developers] can’t fill the numbers in with long-term projections, a bank is going to be skittish about investing in a project,” Miceli stated. 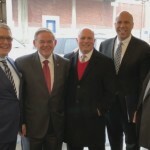 In addition, he said that the city’s regular use of tax abatements has gotten the attention of other developers who otherwise may have overlooked Bayonne. 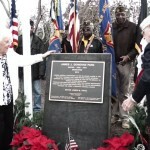 Abatements are necessary if not… nothing will come of Bayonne, the average person has no clue how expensive it is to develop… period thus the average person always has a negative view, or thinks it not fair.